#PelliChoopulu movie drives have been shipped to all locations in USA. Movie is getting a grand release in 50+ theaters across USA. The premiers for 28th of July at all locations have been confirmed in USA by Freeze Frame Films. The movie length is said to be 2Hrs 4Mins. Ticket price is $12 only for premiers and regular shows. 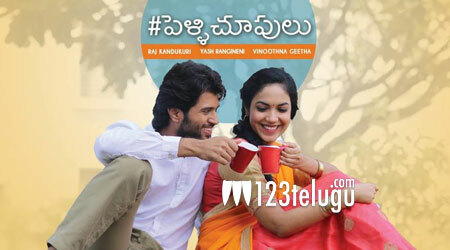 #PelliChoopulu is a new age rom-com starring Vijay Devarakonda and Ritu Varma, music by Vivek- Sagar, directed by Tharun Bhascckar and produced by Raj Kandukuri and Yash Rangineni. Suresh Babu was so impressed with the outcome of this movie that he decided to present it under Suresh Productions. The movie has been receiving rave reviews from its previews. A number of celebrities who watched the preview have shared excellent reviews on different social media platforms. With the attention that it received, this movie is definitely going to join one of the top grossers among small budget movies. Overseas audience have always welcomed this genre (Romantic Comedy) movies. Lets wait and see if it lives up to the expectations. Click Here for the Theaters List and show timings in USA! !